S. Chamanian, A. Muhtaroğlu, H. Külah, “A self-adapting synchronized-switch interface circuit for piezoelectric energy harvesters,” Accepted to IEEE Transactions on Power Electronics, 2019. Y. Demircan, S. Sukas, T. Töral, U. Gündüz, H. Külah, “Exploring the relationship between cytoplasmic ion content variation and multidrug resistance in cancer cells via ion-release based impedance spectroscopy,” Accepted to Sensors and Actuators: B Chemical, 2019. H. Ulusan, S. Chamanian, B. İlik, A. Muhtaroğlu, and H. Külah, “Fully-Implantable Cochlear Implant Interface Electronics with 51.2 μW Front-End Circuit,” Accepted to IEEE Transactions on Very Large Scale Integration Systems, 2019. S. Chamanian, S. Baghaee, H. Uluşan,Ö. Zorlu,E. Uysal-Bıyıkoğlu, H. Külah, “Implementation of Energy-Neutral Operation on Vibration Energy Harvesting WSN,” Accepted to IEEE Sensors, 2018. B. İlik, A. Koyuncuoğlu, Ö. Sardan-Sukas, and H. Külah, “Thin Film Piezoelectric Acoustic Transducer for Fully Implantable Cochlear Implants,” Accepted to Sensors and Actuators A: Physical, 2018. S. Chamanian, H. Uluşan, A. Koyuncuoğlu, A. Muhtaroğlu, H. Külah, “An Adaptable Interface Circuit with Multi-Stage Energy Extraction for Low Power Piezoelectric Energy Harvesting MEMS,” Accepted to IEEE Transactions on Power Electronics, 2018. H. C. Ateş, E. Özgür, and H. Külah, “Comparative Study on Antibody Immobilization Strategies for Efficient Circulating Tumor Cell Capture,” Biointerphases, Vol. 13, No. 2, 021001, March 2018. E. Aydın, M. Kangül, F. Gökçe, Ö. Zorlu, and H. Külah, “A Second Harmonic Based Resonance Characterization Method for MEMS Electrostatic Resonators,” Sensors and Actuators A: Physical, vol. 274, pp. 220-230, 2018. O. Yaşar, H. Uluşan, Ö. Zorlu, and H. Külah, “Optimization of AA-Battery Sized Electromagnetic Energy Harvesters: Reducing the Resonance Frequency Using a Non Magnetic Inertial Mass,” IEEE Sensors, Vol. 18, No. 11, pp. 4509- 4516, June 2018. H. Ulusan, S. Chamanian, W. P. M. R. Pathirana, O. Zorlu, A. Muhtaroglu, and H. Külah, “A Triple Hybrid Micropower Generator with Simultaneous Multi-Mode Energy Harvesting,” IoP Smart Materials and Structures, Vol. 27, No. 1, 014002, Jan 2018. M. Kangül, E. Aydın, F. Gökçe, Ö. Zorlu, H. Külah, “Analysis and Elimination of the Capacitive Feedthrough Current on Electrostatically Actuated and Sensed Resonance Based MEMS Sensors,” IEEE Journal of Microelectromechanical Systems, Vol. 26, No. 6, pp. 1272-1278, December 2017. K. Gharehbaghi, F. Kocer, and H. Külah, “Optimization of Threshold Self-Compensated UHF Rectifiers with Charge Conservation Principle,” IEEE Transactions on Circuits and Systems I: TCAS-I, Vol. 64, No. 9, pp. 2380-2387, September 2017. H. Ulusan, O. Zorlu, A. Muhtaroglu, and H. Külah, “A Highly Integrated 3 V Supply Electronics for Electromagnetic Energy Harvesters with Minimum 0.4 Vpeak Input,” IEEE Transactions on Industrial Electronics, Vol. 64, Issue 7, pp. 5460-5467, July 2017. K. Gharehbaghi, O. Zorlu, F. Kocer, and H. Külah, “Modelling and efficiency optimisation of UHF Dickson rectifiers,” IET Circuits, Devices & Systems, Vol. 10, Issue 6, pp. 504-413, November, 2016. S. Chamanian, H. Uluşan, Ö. Zorlu, S. Baghaee, E. Uysal-Biyikoglu, H. Külah, “Wearable battery-less wireless sensor network with electromagnetic energy harvesting system,” Sensors and Actuators A: Physical, Volume 249, Pages 77-84, October 2016. G. Bahrieh, M. Erdem, E. Ozgur, U. Gunduz, and H. Külah, “Characterization of the Distribution of Rotational Torque on Electrorotation chips with 3D Electrodes,” Electrophoresis, Vol. 36, Issue 15, pp. 1785-1794, August 2015. H. Ulusan, K. Gharehbaghi, O. Zorlu, A. Muhtaroglu, and H. Külah, “A Fully-Integrated and Battery-Free Interface for Low Voltage Electromagnetic Energy Harvesters,” IEEE Transactions on Power Electronics, Vol. 30, No. 7, pp-3712-3719. July 2015. Y. Demircan, A. Koyuncuoğlu, M. Erdem, E. Özgür, U. Gündüz, H. Külah, “Label-free Detection of Multidrug Resistance in K562 Cells through Isolated 3D-Electrode Dielectrophoresis,” Electrophoresis, Vol. 36, pp. 1149-1157, May 2015. E. Erdil, K. Topallı, N. S. Esmaeilzad, O. Zorlu, H. Külah, and O.A. Civi, “Reconfigurable Nested Ring-Split Ring Transmitarray Unit Cell Employing the Element Rotation Method by Microfluidics,” IEEE Transactions on Antennas & Propagation, Vol. 63, pp. 1163-1167, March 2015. Y. Adiguzel and H. Külah, “Breath Sensors for Lung Cancer Diagnosis,” Biosensors and Bioelectronics, Vol. 65, pp. 121-138, March 2015. G. Bahrieh, M. Erdem, E. Ozgur, U. Gunduz, and H. Kulah, “Assesment of Effects of Multi Drug Resistance on Dielectric Properties of K562 Leukemic Cells Using Electrorotation,” RSC Advances, 4, pp. 44879-44887, 2014. U. Sönmez, H. Külah, and T. Akın, “A ΣΔ Micro Accelerometer with 6 µg/√Hz Resolution and 130 dB Dynamic Range,” Analog Integrated Circuits and Signal Processing, Vol. 81, pp. 471-485, 2014. 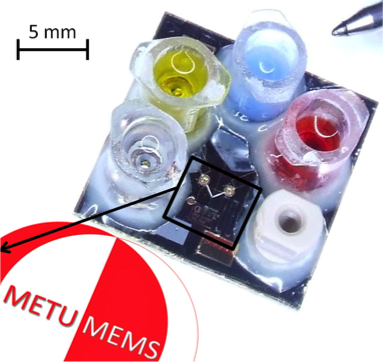 L. Beker, Ö. Zorlu and H. Külah, “A Parylene Coating Based Room Temperature Wafer-Level Attachment Method for MEMS Integration with Zero Applied Force,” Sensors and Actuators A, vol. 215, pp. 1-7, August 2014. J. Musayev, C. Altıner, Y. Adıgüzel, H. Külah, S. Eminoğlu, and T. Akın, “Capturing and Detection of MCF-7 Breast Cancer Cells with a CMOS Image Sensor,” Sensors and Actuators A, vol. 215, pp. 105-114, August 2014. H. Torul, H. Ciftci, F. Dudak, Y. Adiguzel, H. Külah, İ. Boyaci, U. Tamer, “Glucose determination based on two component self–assembled monolayer functionalized surface–enhanced Raman spectroscopy (SERS) probe,” Analytical Methods, RSC, vol. 14, pp. 5097-5104, 2014. H. Ceylan Koydemir, H. Külah, A. Alp, A. H. Üner, G. Hasçelik and C. Özgen, “A Fully Microfabricated Electrochemical Sensor and its Implementation for Detection of Methicillin Resistance in Staphylococcus aureus,” IEEE Sensors, Vol. 14, No. 6, pp. 1844-1851, June 2014. J. Musayev, Y. Adıgüzel, H. Külah, S. Eminoğlu, and T. Akın, “Label-free DNA Detection Using a Charge Sensitive CMOS Microarray Sensor Chip,” IEEE Sensors, Vol. 14, No. 5, pp. 1608-1616, May 2014. H. Ceylan Koydemir, H. Külah, C. Özgen, “Solvent Compatibility of Parylene C Film Layer,” IEEE Jounal of MEMS, Vol. 23, No. 2, pp. 298-307, April 2014. A. Rahimi, O. Zorlu, A. Muhtaroglu, and H. Külah, “An Electromagnetic Energy Harvesting System for Low Frequency Applications with a Passive Interface ASIC in Standard CMOS,” Sensors and Actuators A, vol. 168, pp. 158-166, 2012. A. Rahimi, O. Zorlu, A. Muhtaroglu, and H. Külah, “A Fully Self-Powered Electromagnetic Energy Harvesting System with Highly Efficient Dual Rail Output,” IEEE Sensors Journal, Vol. 12, No. 6. June 2012. J. Chae, H. Külah and K. Najafi, “A Monolithic Three-Axis Micro-g Micromachined Silicon Capacitive Accelerometer,” IEEE Journal of MEMS, Vol. 14, No. 2, pp. 235-242, April 2005. J. Chae, H. Külah, and K. Najafi, “A CMOS compatible high aspect ratio silicon-on-glass in-plane micro-accelerometer,” Journal of Micromechanics and Microengineering, Institute of Physics Publishing, Vol. 15, No. 2, pp. 336-345, February 2005. J. Chae, H. Külah and K. Najafi, “An In-Plane High-Sensitivity, Low-Noise Micro-g Silicon Accelerometer with CMOS Readout Circuitry,” IEEE Journal of MEMS, Vol. 13, No. 4, pp. 628-635, August 2004.